Tax in Alabama, where I live, is 10% so I thought I would wait on this one. Friend bought one and brought it to my backyard range. What a hoot to shoot! Yeah the trigger isn't all that great, but it looks good and shoots great too. My local dealer had one left from a ten gun buy. Gave me one heck of a deal at $550.00 out the door! I wish someone would try one of those mounts out to see if they work. A local store around here had one about a week ago when I was in there, it was heavy and felt like a solid build. I saw this on another website and thought it might be of interest here. It is conversion of the new .22LR STG44 into a full auto weapon. Many fairy tales begin with "Once upon a time...." but the silliest fairy tale of all time starts out with "In the beginning...."
Sounds like some SOT has a "tame" CLEO who sent him a demo request letter for that configuration so he could build it. It seems to be the case. If you check this thread it is mentioned. That full auto is the shiz. I got mine to the range last week and found the same problem with the sights. I haven't fine tuned the sight setting or tested it for accuracy, but it looks like you have to set the sights on 800 yards to get point of aim at 50 yards. Everything else worked fine. It's really a fun rifle to shoot, and doesn't seem to be ammo sensative. I ran 100 rounds of Federal Game Shock (40 grain) through mine without a hitch. As soon as I get the sights set properly I plan to take it to a steel challenge match and see how it handles. 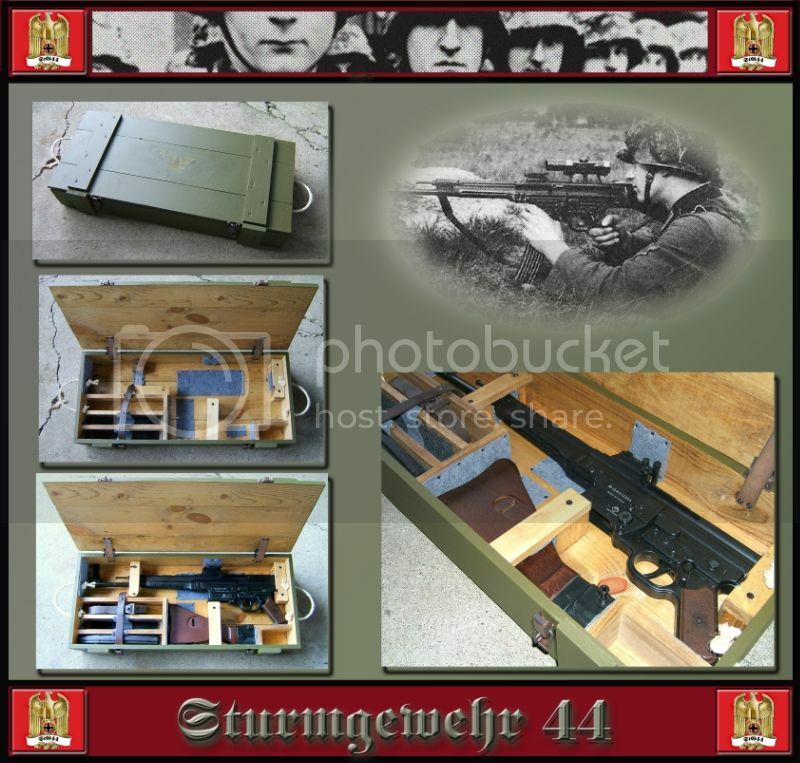 I think it will look nice when it meets is "big brother", my original WWII MP43. When I get the STG44, I'll post some "togetherness" pictures. On they way to the range, I stopped at my FFL and picked up my STG44. Works like a champ. I also had my original MP43 along for the ride. Here are "grandfather - grandson" pictures. 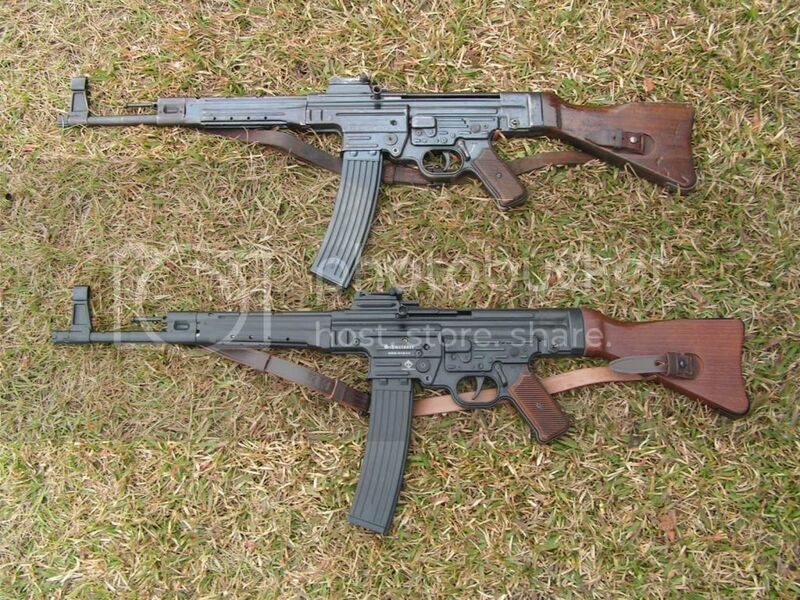 MP43 on top, STG44 on bottom. Rather good "copy" if you ask me. Has anyone else had this problem with the new STG44? The entire front assemble is "loose". It slides forward when the gun is picked up by the front hand guard. The only thing which keeps the front assembly from sliding off the barrel completely is the sling. Here is a picture of the front hand guard and receiver. It looks like a pin is missing which would fix the front assembly to the receiver. Has anyone else had this problem? Wow, they did a better job of replicating them than I thought. Must say though that grandpa is awesome. I've wanted one of them for years, but so far I have settled for junior. I haven't had the problem you describe, something isn't right there. No. 07 FFL with SOT can build whatever and however many post sample machine guns he chooses to. Once built, they can only be sold to Govt/LE or to other SOT dealers who must have a "law letter" for the transfer process to be approved by ATF. Makes me wonder if he made that select fire or just full auto? Pure full auto would get very boring after the first few mags. I thought the same thing. I am more impressed than I was previously. Just what I thought, those guns are not accurate at all, add the the pic of the rifle missing the pin and I would not have one unless it was free, But, you guy's enjoy yours and if one of you can, Show us one that shoots. Funny, I was dissappointed in mine (thought it was overpriced) until I shot it. Mine actually shoots pretty good for a short tube, somewhat eased the pain of the price. Still, I believe it is a $400 gun at best. Hopefully 50 years from now it will be a good buy. Curious, how many did you test for accuracy? Can't wait to try mine out. Nice. Where did you get the mount? Amazon; searched for "UTG Gen 2 stanag". I emailed ATI about this problem and received a reply the very next day. To identify the exact part which was missing, the sent an exploded diagram with all of the parts identified. I told them which screw was missing and they sent the replacement by FedEx which arrived today. I'll try to install it tomorrow. Their service department is great. Good and rapid replies and fast shipping. What kind of file is it? If it's a picture (.png/.jpg/.jpeg/etc...) you can upload it to imageshack, photobucket, etc... and post it here. I'd be interested in the diagram. If it's a PDF you'll have to upload it to a file sharing website and just post the link. I don't think the administrator on this forum allow the attachment of files to posts. Could you email it to me as a last resort ? All I get on an Amazon search is the HK claw mount. Got a UTG part number for the mount in the pic? p.s. Bigboy1, I can't see the diagram image..
As I said I'm very computer illiterate. The diagram appears in the post as I look at. Perhaps someone who understands computers can fix the problem as I don't have a clue why you can't see the the diagram. I bought one about a month ago. I have about 900 rounds through it with only a few feeding problems and most of them are my fault. I was licky becase the dealer I bought it from had spare mags. I now have 7 mags. I bought the proper web gear and sling from IMA. They have a drop case that is very nice although it is a little spendy. The rear sight problem is a really easy fix. Just unscrew the rear sight, put a spacer under it and screw it back down. You have to figure out haw thick the spacer needs to be. This will raise the rear sight. Which is what you are doing by lifting the aperture. The screw that holds the trigger housing fell out while I was cleaning the gun. It had shot loose. I am going to use a tiny bit of blue locktight to secure it. I really like the gun. When I obtained the six spare 25 rd. magazine I have for mine, I got them in Dec., just before the "rush" started. I did some trading for three of them and I had to pay retail price ($135 for the three and $10 shipping) as the discount houses were all out and were estimating a long wait time for more to come in. I figured it was worth the extra few bucks to have the spare mags. in hand. I haven't looked at the prices lately, if you can find any of them for sale. A local gun store in Alabama has them in stock if anyone wants it PM me and I'll give you the name. I thought I was crazy in hopes of someday purchasing a nice plinker that I stocked up on .22's during the first ammo shortage when "He" got elected. Since then I managed to purchase the STG44 (last year)...still haven't had it out yet. Maybe in a few more weeks when the weather decides to warm up to my liking. Couldn't take that plain looking box so I decided to...I'll let the picture speak. I really like what was done to box in above post. Is it possible that the sling be left on the rifle and the components be stored in their respective areas with no interference? Taking the sling one and off each time can get "old" very fast. 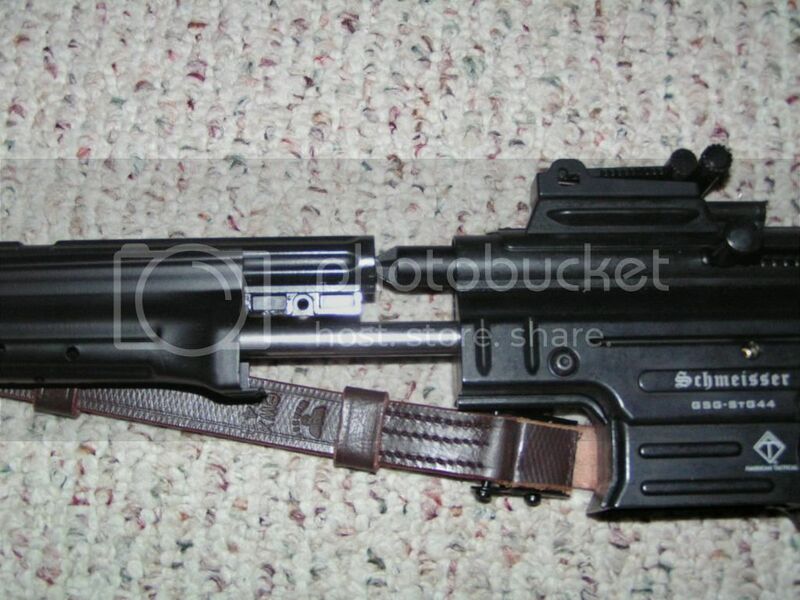 Also another magazine would fit nicely in the slot where the sling is stored. Pictures I have seen in wartime movie footage showed real STGs being issued to troops and the covering of the STGs was just a few boards protecting the rifle. Nothing fancy like a box. One has to remember this was late in the war when many short-cuts were taken to get the equipment to the troops as fast and cheapest as possible. Last edited by BigBoy1; April 05, 2013 at 06:16. Very nice. Something to think about. I would think that it could be stored with the sling attached, I have never had it on. The extra slots were added for mags and or storage. To be honest, I don't understand why they didn't build a box to fit an assembled rifle?...it would have made the whole package a little more *condensed. 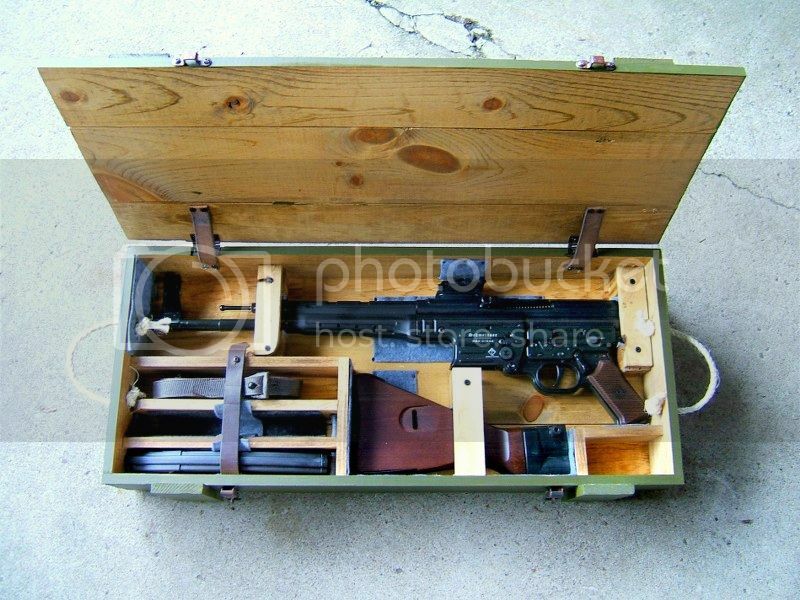 I weighed the fact to build another case/crate using old reclaimed pallet boards...you know to get that "look" that you mentioned, but I have a problem of not being able to get rid of original items that come with a new gun and I would have ended up with two boxes to store. *Maybe something like this Enfield box. ...found a couple of other pics, thought I would put them up. The felt padding used was from a craft store, lightweight...anything heavy will probably not work. There are a few tight places on the box I have, the rifle fits very snug side to side, and I had to shave off a little on the block below the mag well for the buttstock to fit once the felt was added. I used regular carpet tacks to keep period looking. Be aware that these tacks come in different sizes, I used a #4 any thing to big will probably split the pine wood....so be careful if you decide to go that route. Make sure if you use any kind of a tack/staple that it is down into the pad far enough that it will not come in contact with the finish of the metal or wood surfaces. The light grey tabs in the magazine slots are pull tabs to get the mag out. 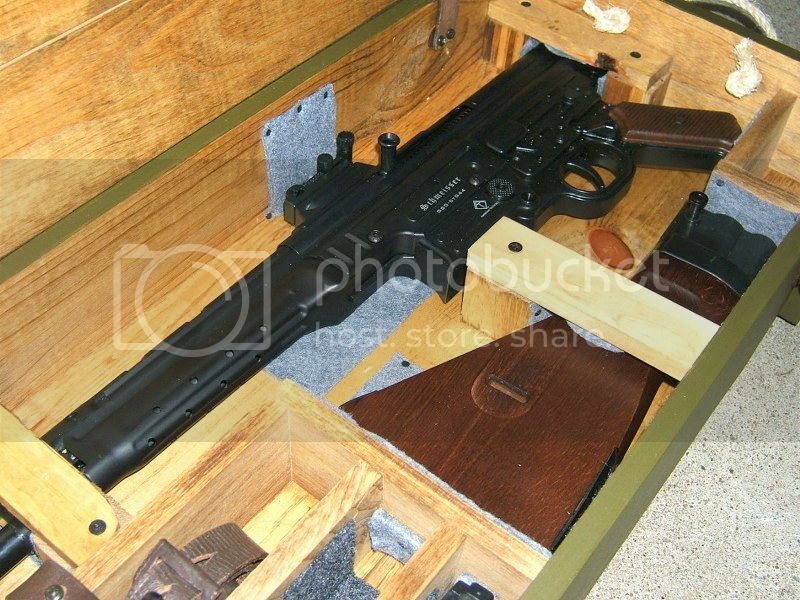 You can see in this photo there is felt added to the bottom of the wood that secures the buttstock, in this case multiple layers (folded) were used to add thickness...tacks were only placed on the corners to "puff " out the felt. Not to get pickie, but in all my years of collecting Germany items, I have never seen any German WWII item with a Phillips screw connector. US inventor Henry Phillips came up with the idea of the cross slotted screw head in 1938. It wasn't in big use in the US until 1941-1942. There could very well be technology transfer of the Phillips head from some US made items to Germany during the war. However, I don't think that happened as all I have seen are straight slotted screws on German made items. Last edited by gunnut1; April 09, 2013 at 16:07. "Of course, you could always remove the grabber screws in the box and replace them with real slotted wood screws"
Thought about it...but not for very long. It's a .22 replica. ...also thought about dragging it down a gravel road to distress it, yes I'm talking about the crate. Last edited by 21HK; April 08, 2013 at 19:34. The box is made by the Amish. It is not supposed to be an exact repoduction just like the gun isn't exact. 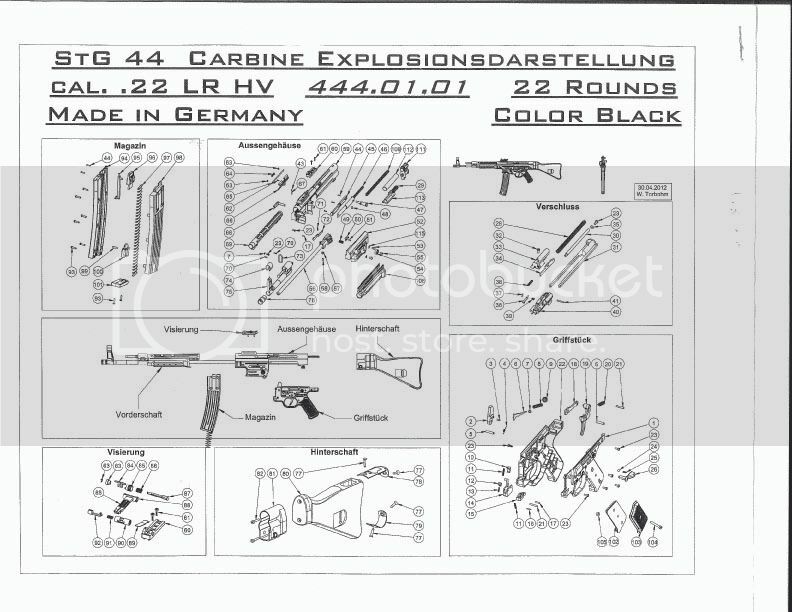 And would the Germans actually ship the gun disassembled like we get ours? Probably not. I would again speculate the box is the size it it for cheaper shipping rates. The gun has allen head machine screws holding it together. I don't think they were original either. 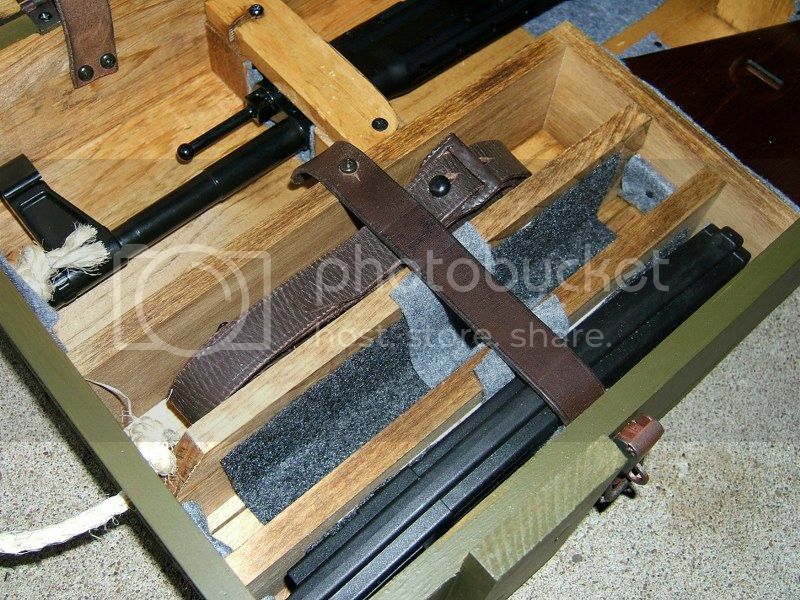 Of course, you could always remove the grabber screws in the box and replace them with real slotted wood screws. I like eveything, except for the rear site problem, just like it is. I love the gun and I can over look the non original way it is built. It is not an exact copy but it is as close as I will ever come to one. But you get the idea! I had messaged the guys at ATI and they said it wouldn't be possible to convert it here to 7.92x33 because of how they did the internals for .22. What a bummer. I took mine completely apart. The receiver is merely a stamping and the barrel and chamber are nothing more than a stainless steel block and a stainless steel tube for the barrel. It would be impossible to convert them to any other caliber. The trigger group is totally different than the original. These are designed as .22 copies and nothing more. Had mine out to the range several times, sight is accurate with no mods needed. Ordered extra mags from Davidsons for $30/each. This rifle will cycle Remington subsonic ammo without issue. So far I have about 1200 rds thru it without issue. I removed all the blocks from inside the crate and converted it to 22lr ammo storage. When these first came out at SHOT, they said only the forst 1000 would have the wooden crates, after that, a cardboard box. I have not seen any packaging other than the pine box crate. Hadnt considered scoping it, but that would let you see how accurate it can be. Went to the range today to certify my Middle Brother in law for a CMP Garand purchase. My nephew went along and I certified him also. I took my STG 44 with us so my nephew could shoot it. He was having trouble with scattering bullets all over the target. I went to adjust the rear sight slider and I discovered it was bent. The gun fell one day and landed on where else, but the rear sight. I guess it got bent then. I am calling ATI tomorrow to see if they can send me a new one. Other than this and the higher than normal adjustment for the rear sight, mine has been flawless. LtRiker, you did not have to move the slider forward to get it to zero? Man that is great. Maybe they fixed the problem. I will ask them. I am not sure if I would have converted the wooden crate or not. That could add dollars to the gun if you ever sell it. Kind of like having the original cardboard box. I took mine and just put it my work room. Glad your gun worked great. Just be careful, they seem to be a little fragile. I like my rifles to shoot right, all of them and especially a New One! The POS flag comes out every time I see one of those, then, just this thread will keep me from buying one. Hope you guys enjoy yours though. BigBoys real one probably shoots decent. Like you didn't have trouble with your FAL when it was new? Didn't buy the rifle to do bench rest shooting. The rear sight thing I can live with. 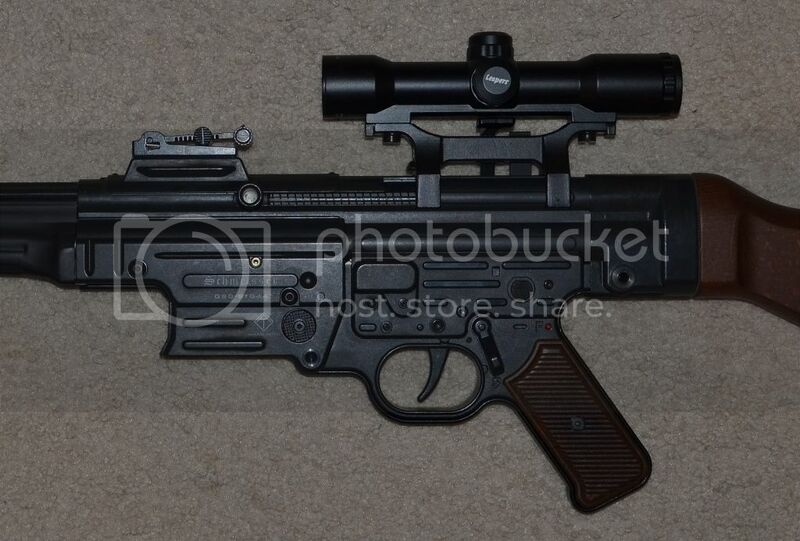 I have read that GSG left the front sight a little high so they could be adjusted for the individual shooter. Dunno if that is true is not. I can't blame the gun for the bent rear sight slider. That was my fault for not securing the gun better. Mine has been 100% on everything else. I have 7 mags and they all function flawlessly. This is fun gun to shoot and it is a damn sight cheaper than the real thing, if you can even find the real thing. I have not dealt with ATI but I understand their customer service is great. I will see. Don't short sell the gun because of a rather simple sight problem it is fixable with very little work. And don't short sell the gun because I was stupid and let mine hit the ground. It is a VERY close copy to the original STG44 and the tall rear sight may have been one of the flaws of the original design. I understand what you say about the big boys. I am a Big Boy and if I had 25 grand to buy an original, I would not hesitate. But I don't so I compromise and buy a $700.00 clone. Different strokes I guess.